The Alaska Chinese Association and its benefactors wish to encourage academic achievement and Chinese cultural awareness. 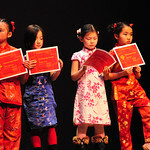 Each year during our Chinese New Year Celebration, the ACA presents scholarship awards to members' children who have both excelled in their academic studies and attended or participated in ACA cultural events. The ACA typically grants $2000 to $4000 in scholarships each year. The actual amount and the number of scholarships are based on the number of qualified applicants and the discretion of the Board. The submission deadline for the 2019 ACA Scholarship is January 18th, 2019. © Alaska Chinese Association 2004-2019. Calligraphy by Lixin Wang.